June 27, 2011 – Tomorrow the real world hits. Up and out the gate at 7:00. I will be meeting class after class at each of our three new schools – one school a day for the next 3 days. After school, around 6:00, I will be meeting with the teachers and administrators showing them how their library is organized and the process of borrowing! Cheers! June 28, 2011 – Totally amazing to have children who have never had books come to the library, listen to a story, and then borrow books. The excitement on their faces is indescribable! Awestruck comes to mind. I couldn’t ask for a better librarian than our new one, Michael, at Gangama Primary! Fantastic librarian! Love doing this work. The kids make it totally rewarding! June 29, 2011 – Another great day seeing classes, this time at Fairway Primary! Billy Paul went with me and helped read books to some of the younger classes that didn’t understand my English, as well. The kids are totally in love with the library and books. Their eyes are huge as they listen to stories. Thank you to our many supporters for changing the lives of these children! June 30, 2011 – Kids everywhere on the school grounds sitting in groups sharing their books; teachers borrowing books; tomorrow every child will receive a paperback and friendship bracelet to take home; squatter toilets up the hill – oh my; long day – but rewarding…..wish I could send the gratitude from the kids through email. July 4, 2011 – Illinois team has arrived! Nice to have them here … tomorrow the work will start once more. 🙂 Yahoo! We will create a high school library at a military base! Ready to work! July 5, 2011 – 13 hour day – total exhaustion! Bombo Road Military Secondary School Library is complete. Fantastic grand opening with top military brass. Several performances – one with a group of young people that could do acrobatics – standing on each other all the way to the ceiling – unbelievable! They were all over the place! July 11, 2011 – What a team! The ladies worked from 9 – 4, with no breaks – including for food! One of our older libraries, Namatala Primary, needed weeded, and reorganized. To be truthful, it is almost more difficult to reorganize shelves, than to create new libraries. Finally finished, the ladies had their first boda ride! Great sports! July 17, 2011 – Illinois team is off to the airport. The van was busy this morning, so they left in a car – which means I didn’t fit! The two teams this summer were incredible. There is no way to even add up all the lives they touched here – children and adults. Each has my highest respect and an ocean of thanks for their work. 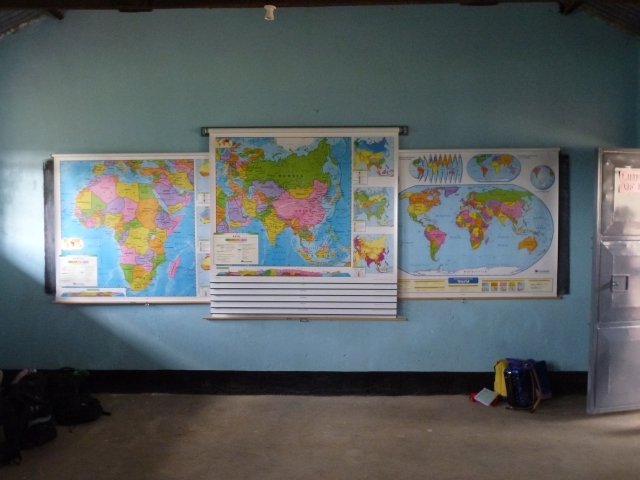 July 19, 2011 – Worked until after 6:00 in our first library at Namirembe Primary yesterday. Totally amazing how worn the books have become in seven years. I’m weeding and preparing the library to have a major restock next year … so much to get done. Spent time training the new librarian and seeing classes, also. Today will be Bat Valley – our second library. 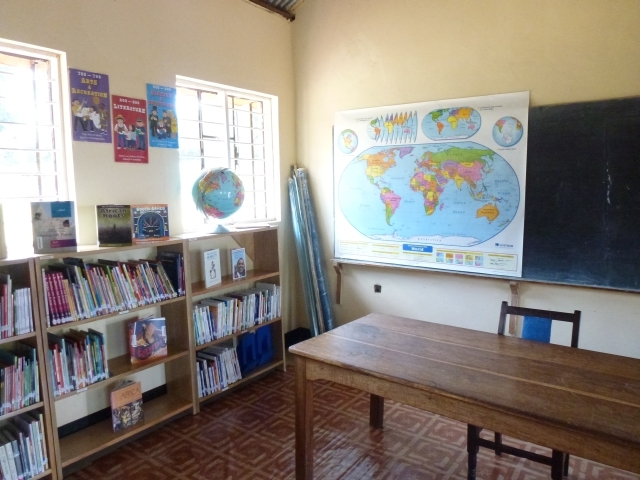 July 20, 2011 – In awe today at one of our libraries created last year, Ugandan Martyrs Primary. The librarian meets with upper classes in the mornings. K – 3 classes are dismissed at 1:00 to go home … or they come to the library to look at books. The floor was totally full of kids laughing and sharing books from 1:00 – 4:00. The librarian also provided blank paper so the kids could try drawing pictures from their books. So inspiring to watch! July 25, 2011 – So excited! I invited the head of the Ugandan Library Association to our librarians meeting – and he accepted. Richard is also a member of the UN. I met him during my last trip. Also, heard from the Commissioners of Education, who said they are anxious to meet with me in August! Cheers! Aug 5, 2011 – Trudy shares her painful night, but wonderful experience, visiting the family of one Caroline, of the students who receive school lunch aid from Bethany United Method Church contributions. Read her blog posting. Aug. 10, 2011 – Had a wonderful meeting this morning, putting together a team to head LOL in Mbale. Irene to arrange meetings, Michael to be the liaison between librarians and headmasters, and Hijera to train new librarians. There will be two librarian meetings each term – plus one ‘drop-in’ visit by Michael or Irene, with reports coming back to me. All is good in Mbale town! Aug. 29, 2011 – So excited! I was told today that the Kampala area headteachers (principals) are planning a follow-up meeting (to the headteachers meeting held last week)to combine the mission statements written by primary and secondary headteachers, into one final LOL mission statement for all schools. These headteachers have truly caught the vision – AND they are going to meet this week, so that I will be able to attend! Yahoo! Aug. 23, 2011 – How can I leave them? How can I not jump on a boda and head to the bush to wrap Damasco, Florance, and Leah in my arms, letting them know that someone cares, instead of boarding an airplane soon headed away from them. Read Trudy’s blog and see photos. Aug. 18, 2011 – Almost time: 13 librarians will be traveling to Mukono from Mbale on the 21st for the night. On Sunday, the 22nd, our 15 librarians from the Kampala area will be joining them. Totally excited about a day of sharing literacy ideas and training – plus some fun activities, as well! It has been interesting making an agenda, then adjusting over and over. All of the librarians together – – what can I say! WOW!